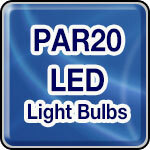 PAR20 LED Replacement Light Bulbs: PAR 20 is one of the better applications for LED because of it's directional nature. LED PAR 20 Light Bulbs provide similar light output and beam profile while using only a fraction of the energy. Genesis Lamp has an growing selection PAR20 LED light bulbs at great pricing... all available online.